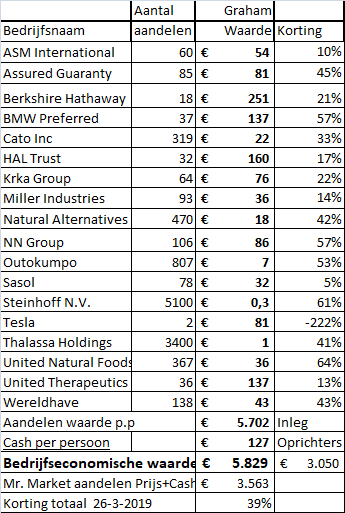 We hebben BMW3 Preferred shares bijgekocht onder €62, we hebben ASM International deels verkocht boven €48. 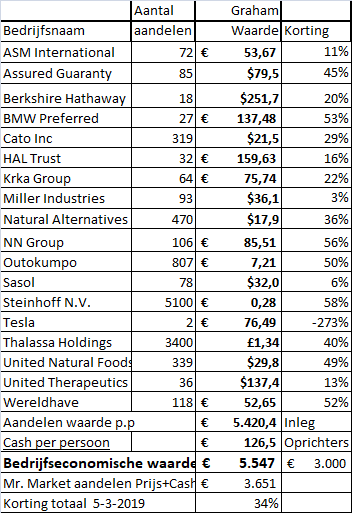 De afschrijvingen op boekwaarde bij United Natural Foods (leverancier van supermarkten in de VS) viel mee na de overname van SuperValu. 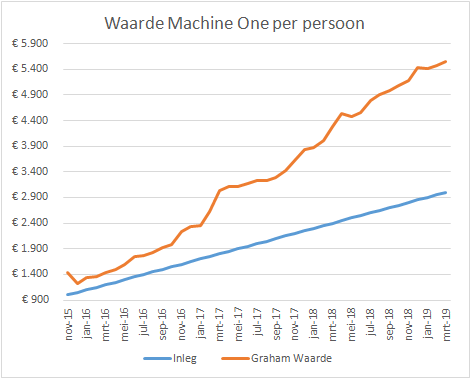 Hierdoor is de Graham waarde sterk gestegen in maart. We hebben een budget van €2 100 (inclusief te ontvangen dividenden) om aandelen (bij) te kopen. Thor Industries onder $60 is een mogelijkheid. Reliance Steel & Aluminium (ticker RS) heeft een 100% Graham Defensive score bij Validea en zit in de AAII screen. Expenses and long-term debt increased in 2018. The company is opening PLA plants in Thailand and Europe. I don't understand the business or prospects. SECTOR: [FAIL] Corbion is a bio-technology company? and therefore Benjamin Graham would consider it too risky. SALES: [PASS] The investor must select companies of "adequate size". This includes companies with annual sales greater than €260 million. Corbion's sales of €897 million, based on 2018 sales, pass this test. CURRENT RATIO: [FAIL] The current ratio must be greater than or equal to 2. Companies that meet this criterion are typically financially secure and defensive. Corbion's current ratio €350m/€260m of 1,3 is not good enough. LONG-TERM DEBT IN RELATION TO NET CURRENT ASSETS: [FAIL] For industrial companies, long-term debt must not exceed net current assets (current assets minus current liabilities). Companies that do not meet this criterion lack the financial stability that this methodology likes to see. The long-term debt for Corbion is €185 million, while the net current assets are €90 million. Corbion fails this test. 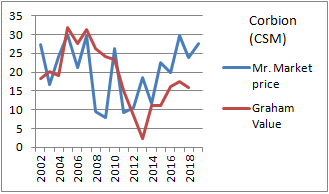 LONG-TERM EPS GROWTH: [FAIL] Companies must increase their EPS by at least 30% over a ten-year period and EPS must not have been negative for any year within the last 5 years. Companies with this type of growth tend to be financially secure and have proven themselves over time. 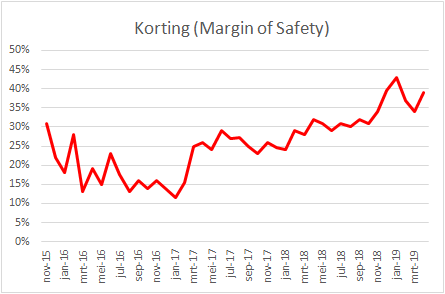 Corbion's earnings have not increased much over the past ten years and it has made losses recently. Earnings Yield: [FAIL] The Earnings/Price (inverse P/E) %, based on the lesser of the current Earnings Yield or the Yield using average earnings over the last 3 fiscal years, must be "acceptable", which this methodology states is greater than 6,5%. Stocks with higher earnings yields are more defensive by nature. Corbion's E/P of 4% (using the average over the past 3 years Earnings) fails this test. Conclusion March 2019: The stock doesn't seem cheap. Not for the Graham Defensive investor. We hebben nu EUR 2 023 cash (126 per persoon). Budget is 100% in aandelen. Aankoop eind maart? 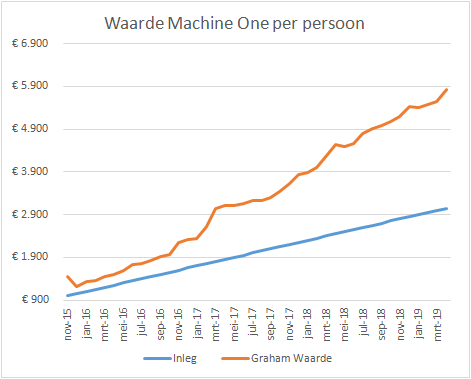 Goede resultaten van onder andere ASM International, Miller Industries en Assured Guaranty drijft winst per aandeel en boekwaarde omhoog waardoor Graham Waarde stijgt.